After the enormous success of Maleficent last year, Disney is now setting out on a journey to revisit many of their past fairy tale classics and reintroduce them in a live action setting. Adaptations of Pinnochio, The Little Mermaid, Beauty and the Beast, and even The Sword in the Stone are on the way; but for now, we focus on one of the most renowned of all time, Cinderella. 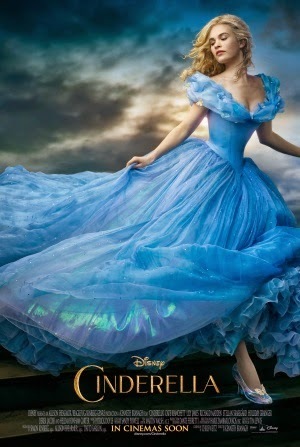 Much like the original Disney animated film, Cinderella features the eponymous heroine (Lily James) forced into slave labour by her wicked stepmother Lady Tremaine (Cate Blanchett) and stepsisters Drisella (Sophie McShera) and Anastasia (Holliday Grainger). Her depressing life soon reaches a turning point when she befriends the adventurous Prince 'Kit' Charming (Richard Madden), who is shortly keen to be Ella's suitor; leading to the illustrious ball hosted in his honour that will change both of their lives forever. Cinderella doesn't attempt to turn the fairy tale into some dark rehash with more sinister themes, remaining loyal to the original classic with a beautifully saturated visual palette, some charming special effects, and a touch of light hearted humour. The gags stem mainly from the clumsy wicked stepsisters, as well as Ella's animal companions, but such humour is not just what the actors have to offer; Lily James' adorable performance captures the beauty and innocence the character has always been comprised of, and her chemistry with Madden helps to develop their relationship beyond the slightly outdated 'love at first sight' plot device. The story is sweepingly romantic and often touching, thanks to a superb supporting cast, particularly Blanchett and Helena Bonham Carter, and an engaging yet simple narrative. In an age where studios seem overly keen to reinvent franchises with darker tones and overly complex ambitions, it's nice to see a pleasant fairy tale brought to life in a wonderful live action setup - with no pretentious attempts to be edgy or sinister. It harkens back to Disney's prime and never fails to embrace it's magical premise, making for an approachable experience for all ages, and a truly satisfying one for long term Disney fanatics.